Vancouver’s North Shore is undoubtably one of the best and most challenging mountain bike area in the world, and North Shore mountain bikers are some of the best, most responsible and well organized riders around. If you’re want to experience North Shore mountain biking, do your homework and come prepared. 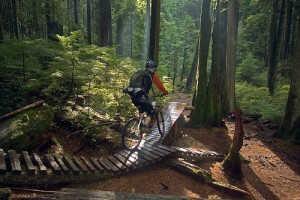 There are three major mountain bike areas on the North Shore: Cypress Mountain, Mt Fromme and Mt Seymour. For a long time the mountain bike trails were kept a secret from outsiders. However, you can now purchase route maps at local mountain bike shops. They say that many secret trails were intentionally left off the maps, but don’t worry; there are more than enough to keep you busy. The trail parallels the river, crosses it after about 10 minutes and takes you farther into the backcountry. You’ll get some boardwalk riding and excellent trail riding. An alternative is to ride the undulating 11 kilometre road into the heart of the Lower Seymour Conservation Reserve (also known as the Seymour Demonstration Forest). This road is popular with hikers and film crews. In fact, more than 400 movies and TV productions are shot here each year, so you might get to watch a movie shoot along the way. To get to the beginning of the ride, cross Lions Gate Bridge, go right toward North Vancouver then left at the first traffic light on Capilano Road. Follow Capilano Road to its junction with Highway #1. Access the highway where the sign reads, Route 1 East. Exit Highway #1 at Lynn Valley Road and go right at the stoplight. Stay on Lynn Valley Road until it intersects with Dempsey Rd. There’s a small convenience store on the corner. Park and begin your ride from this point. Continue on Lynn Valley Road as it narrows to one lane and watch for a small road that goes off to the right. It will say, Rice Lake. Take the Rice Lake road past the parking lot and gate, and you’ll be on your way. Finally, you can ride the Old Grouse Mountain Highway. It’s a steady uphill dirt road all the way to Grouse Mountain. There are always mountain bikers on this road, so you’ll never be far from information. To get there, take the Lynn Valley Road until it intersects with Mountain Highway, which veers off to the left. Take Mountain Highway to the top, find a legal place to park, and you’re ready to ride. The North Shore Mountain Bike Association provides up-to-date information, maps and contact info for local mountain bikers. You can also contact good local bike shops for trail and equipment information. Here are the best. EcoRide Vancouver – EcoRide is a local mountain bike and hiking tour company that utilizes the great trails on the North Shore.